When the westernmost Eastern Bloc countries joined the European Union, there was an accompanying spike in fascination with the shifting East/West divide. Numerous exhibitions were organized around the world focusing on Eastern Europe and the post-communist imagination. The pinnacle seemed to be ‘PolskaYear,’ a 2009/10 spotlight on Polish culture in England, which was, at the time, the primary recipient of temporary workers from the newly-minted EU state. Many English arts organizations partnered with the Polish Cultural Institute to feature a range of Polish art, music, film and literature, with the centrepiece being Mirosław Bałka’s monumental Turbine Hall installation, ‘How It Is.’ The trend filtered to North America where, in 2011, Toronto’s Power Plant gallery hosted ‘Rearview Mirror: New Art from Central and Eastern Europe,’ and simultaneously, the New Museum in New York organized ‘Ostalgia,’ a far larger examination of the same theme. These exhibitions gave the westerner a glimpse into previously forbidden knowledge, while many Eastern European artists examined their liminal position between East and West, as if the offspring of two feuding parents. With portions of its history lost in competing narratives of war and occupation, the past in Eastern Europe has persisted in its effects on space: in the remnants of shifting borders, quick and haphazard urban development, cramped, clandestine interiors and now the visible effects of foreign capital. Many Polish artists have since explored the peculiarities of their post-communist environs, which, though not unique to Poland, hold a special place in its imagination. Artists like Monika Sosnowska, Robert Kuśmirowski, Marcin Dudek and Goshka Macuga, among others, have rebuilt or reorganized the past so as to position it from a different perspective. A new addition to this list is 30-year-old Przemek Pyszczek, an émigré Polish artist raised in Winnipeg who relocated to Berlin six years ago. Pyszczek left Poland with his parents when he was just two years old, shortly before the fall of communism. Growing up, his vision of ‘home’ was shaped by photographs and his parents’ memories. Upon returning as an adult, he immediately noticed the capitalist veneer covering an infrastructure built largely after the Second World War. Apartment blocks that were once grey were now decorated with bright geometric patterns – swirls, waves, circles and squares – giving the absurd impression of a decorative band-aid stuck over a troubled past. All the while vendors in shabby outdoor markets continued to sell sauerkraut out of plastic pails. Garishly coloured advertisements were draped over Stalinist stone buildings while cheaply built, foreign stores littered the landscape. The past persists even if it is made strange by the imposition of a foreign aesthetic rendered all the more problematic with its own connotations of occupation. For someone raised in Canada, the Polish landscape can give the impression of an ill-fitting capitalism, like a hand-me-down from the West. The sculptures that Pyszczek makes in response continue the aesthetic tension of mismatched pairs. Modernist forms rub shoulders with recognizably utilitarian objects like children’s play structures and window grates. Both are directly related to the aesthetics of communist-era neighbourhoods that, post-1989, received their superficial facelifts. 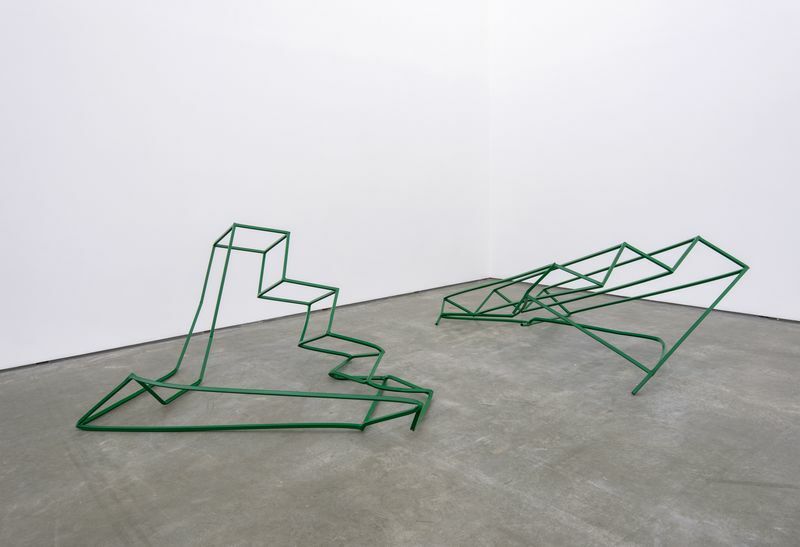 His colourful ‘Playground Structures,’ 2015, exhibited last summer in a two-person show at Peres Projects, Berlin, are off-kilter and fragmented; some of them look as if they had been launched from the sandbox landing haphazardly in the gallery. For this work the artist orders the structures pre-made from Polish metalworkers. He then cuts them up and begins his rearrangements. The results are not as drastic as this process would imply. Pyszczek hones in on the strangeness of the original structures, which, as seen from his personal collection of photographs, already look idiosyncratic, closer to sculpture than a functional jungle gym. Pyszczek also produced paintings that drew their compositions from the façades of Polish post-war apartment blocks. Were it not for the stylized window grates covering them, they might be mistaken for hard-edge, neo-modernist pictures. Both series directly relate to his childhood, though not necessarily as a site of memory. Just as important are the shared histories beyond memory, those that have been distorted, censored or simply forgotten. Of the artists directly referencing Poland’s communist past, Pyszczek’s reconfigured architecture is most like the work of Monika Sosnowska, an artist who, until the last decade, has remained all but unknown in North America. Though born and raised in Poland, she too is not immune to the strangely layered accretion of history that characterizes Poland’s urban settings. This history is not preserved as official narrative but is the product of rapid change as well as wilful (and forced) forgetting, ignoring, censoring and selective remembering. Imprinted into it are imagined pasts, most often evidenced through the politics that surrounded post-WWII reconstruction, as well as hoped-for futures. Sosnowska, like Pyszczek, augments pre-made metal structures from specific historical moments. For her first Canadian solo show at the Contemporary Art Gallery, Vancouver, curated by Jenifer Papararo and Ryan Doherty at SAAG in Lethbridge in 2013, Sosnowska presented warped, green metal sculpture based on vendor stands from Jarmark Europa, the massive post-1989 contraband bazaar that took place in Warsaw’s 10th-Anniversary Stadium. Today the communist landmark lies overgrown with weeds, though it has served as the site for other artworks, most notably Yael Bartana’s 54th Venice Biennale contribution for the Polish Pavilion, the filmic trilogy ‘…And Europe Will Be Stunned,’ 2011. One of Sosnowska’s best-known works is ‘1:1,’ 2007, a steel copy of a postwar apartment frame produced in Warsaw’s now defunct housing block factory. The structure was twisted and crumpled by engineers to fit into the neoclassical Polish Pavilion at the 52nd Venice Biennale thus inverting architectural history in one ironic gesture. Warsaw, a city that experienced near complete destruction during WWII, has long been Sosnowska’s primary source material as well as her home. Over the years, she has documented the Polish capital’s changes and compiled the material in to a 2008 book called ‘Sketches and Photographs’ – a parallel to Pyszczek’s own photos of residential neighbourhoods. In the last few years, she has begun to apply her method of architectural deformation to the West. 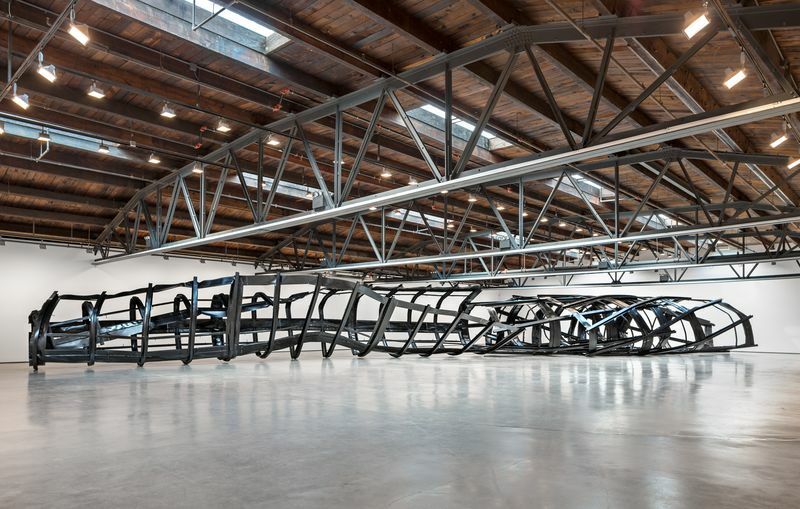 ‘Tower,’ 2014, is a reshaping of Mies van der Rohe’s Chicago Lakeshore apartment façade into a limp spiralling form displayed on the floor of Hauser & Wirth. While still historically on point, I can’t help but wonder if the transatlantic shift of Sosnowska’s aesthetic strategy holds the same political urgency it does in a Varsovian context. Both Sosnowska and Pyszczek negotiate the effects of time as architectural remnant, though not necessarily architecture itself. History bubbles up like repressed memory, or in Pyszczek’s case, collective memory that was not experienced first hand. The aesthetic of childhood and domesticity not only relate to his own experience, but to the idea that Eastern Europe was long seen as immature in comparison to the West, a perception that the many five-year plans of the communist era were intended to remedy. Now, ironically, the neighbourhoods of Pyszczek’s past have become infantilized with murals that, as the artist noted in a recent interview, look ‘…like a kid drew it all on Microsoft Paint.’ The psychological effect of Sosnowska’s sculpture is a markedly darker tone, though many of her works also elicit a sense of playfulness. This play, however, sometimes feels more like a dystopian funhouse, combined as it is with feelings of helplessness, fear or exhaustion. In their mixture of past and present, both artists are caught in the cracks and pitfalls of history, exploring the emotional ruins left in the space between East and West. In his eccentric but compelling essay on Cold War psychology, ‘The Psychic Soviet’ (Drag City, 2006), DC underground rocker and sometimes cultural critic Ian Svenonius maps the dynamic of the nuclear family onto the terrain of nuclear conflict. He describes the Eastern-bloc states as children caught between two dysfunctional parents – Russia, the authoritarian mother, and the United States, the vainglorious father. The fall of the Soviet Union, he bombastically declares, was a matricide committed by the Paternal West in collusion with his now guilt-ridden children. Left without a feminine balance, Father has ‘‘gone to seed,’ abandoning former pretenses of idealism and lashing out in delusional fits.’ Characterized as a megalomaniacal hero – anti-intellectual, arrogant, glamorous, cunning – Father, Svenonius writes, molests his children and spreads his seed across the globe. Ten years later, the account of the delusional father seems even more apt. As the memory of the mother bubbles up in unexpected ways, Father flails against innumerable enemies from wars on terror, wars on drugs to wars on women, all of which he warns cannot be resolved by ‘the nanny state.’ Now, against the backdrop of Donald Trump’s surreal candidacy for the Republican leadership, we are privy to ever more hysterical fits, many of which are explicitly aimed at women. In a more specifically Polish context, we find knee-jerk rejections of socialist doctrine resulting in a paternalistic Catholic society that embraces the market wholesale while dismissing any pre-1989 innovation as uniformly bad. The divisive histrionics increasingly points to the feminine absence, Svenonius’s matricide, that must be denied at all costs using ever more extreme policies and rhetoric. With their evocations of the Polish past, Sosnowska and Pyszczek might be writing elegies to the Mother, but what form does this elegy take if the children were themselves complicit in her death? Pyszczek’s domestic and childhood references speak directly to the archetypal role of mother as caretaker, but in a symbolic repeat of matricide the site of home is now neatly packaged. His aestheticized mixtures of past and present fit neatly into an art market still hungry for the spoils that spilled forth after the fall of the Iron Curtain. Sosnowska’s deformed monuments, on the other hand, are the manifestations of a lost past that keeps coming back in new form. Her undulating edifices could be akin to the involuntary twitches of the hysteric, who has transformed a poorly understood history into psychological unintelligibility. If the distorted recollections are a form of elegy, it’s an ambivalent sort that reveals a distrust of the future rather than a nostalgia for the past. As collaborators in the matricide, many Eastern European states do not crave restoration, but faced with Father’s excess, they equally do not see an obvious path to the future. There’s an anecdote I was told that sums up the relationship of space and history so important not only in the works of the artists discussed here, but in almost all Eastern European artists who incorporate the aesthetics, archives and memories of their pasts. During ‘Polska! Year’ I visited Bałka’s imposing Turbine Hall installation, How It Is, on multiple occasions. The monumental work consisted of an elevated metal container, ominously reminiscent of the freight cars and barracks of the Holocaust. Its yawning, dark entrance faced the back wall of the former power plant and was accessible by means of a sloping metal ramp. The interior was such a thick, consuming black that one could lose all sense of space upon entering it. As the darkness swallowed you, there was the eerie sensation of dissolution, as if the boundaries of the body were disappearing. It was during one of my many visits that I spoke to a guide who recalled a visiting school group where a teenage boy, overcome with the sensation of infinite space, proceeded to run full-tilt into the thick black until he hit the back wall and nearly broke his nose. Though rooted in Polish history, Pyszczek’s and Sosnowska’s decontextualized architectural forms speak to the fallibility of all structure. Within the hystericized rhetoric of contemporary politics there lies the distorted affect of Soviet history regurgitating itself like a regretted take-out meal, unidentifiable but flavouring everything thereafter. There are good portions of history that will be irretrievable in places like Poland, where war and occupation have destroyed historical continuity, though this serves to remind us that continuity is itself manufactured. The effects of all histories, remembered or not, persist and must be unpacked, imagined or experienced in alternate ways. There is a responsibility to face these ghosts even if our efforts will be necessarily limited or flawed. No matter how opaque a history, its unseen presence (or absence) will always be felt, and if left unnoticed we might run headlong into it, only to be left with a bloody nose.